A late start to my run and it was HOT. Ran slow but faster than Sunday’s run. Afterwards I took my nephews to see “Finding Dory”. Have you seen it? It is a very cute movie. 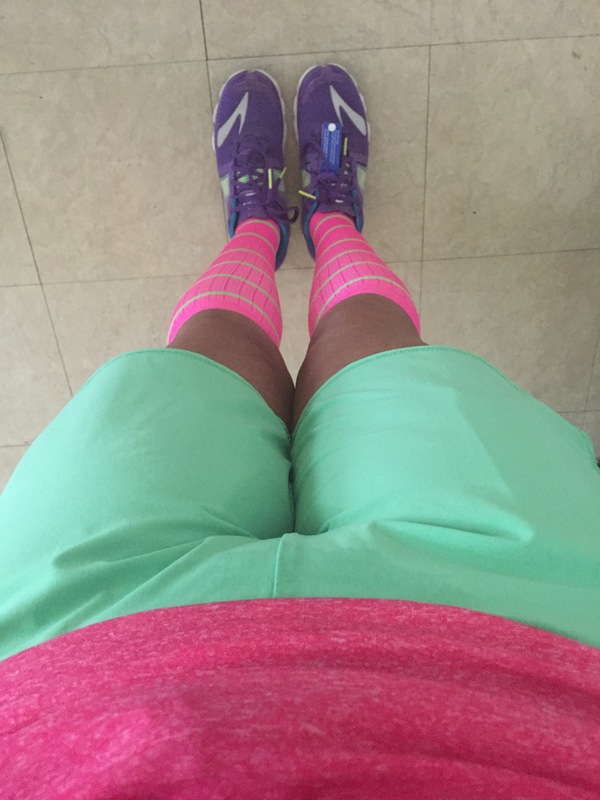 Yes, sometimes I match my socks with my running outfit. Don’t you? W/up @12:00 and c/d @11:45. Recovery @13.02. Each interval was done at a different pace-9:23, 9:14, 9:05, 8:57. Pleased with this workout. 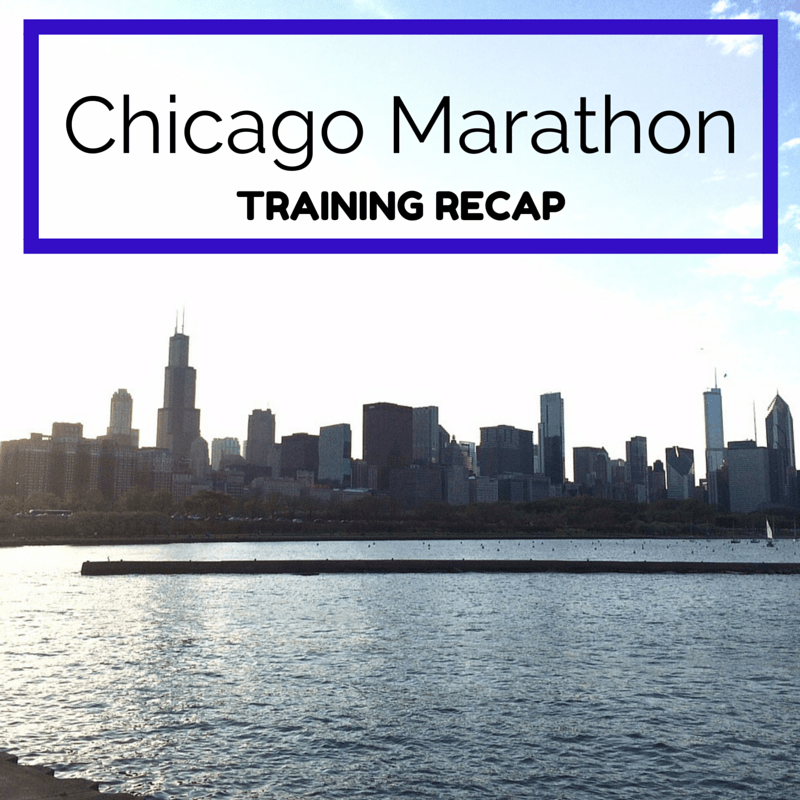 I had to go slower with my speed workouts because I had been doing them too fast due to a lofty marathon finish time but now I feel much more comfortable with these paces. 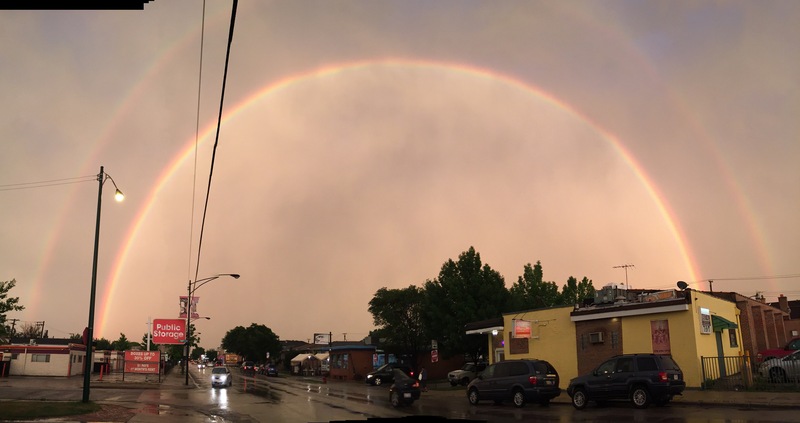 We had some crazy weather in the evening; check out my picture below of two rainbows. I’ve never seen anything like it. W/up and c/d @11:07. I did this run on the treadmill. I alternated a different song with paces of 10:22, 10:10, and 10:00 and was soaking wet when I was done. Ran in the new Brooks Launch 3 shoes. Love them! Even Lola thinks they’re cool. I decided to switch my run and do Sunday’s run today because I knew tomorrow would be an even busier day. Felt great during most of the run then during last 2 miles I could not keep up with my group. Felt bad because I made a commitment to be a pacer for that specific group and felt like I have failed. After the run I spoke with one of the coaches and told him how I felt and suggested to move me to the 11:00 group. He agreed. I am afraid that as our runs get longer, I will not keep up with my group. I was a pacer during the fall and winter seasons and did OK but our longest run was 12 miles. I forgot to stop my watch during our water breaks but overall it was still a great run. I did a few errands with my mom and stopped at two Office Max to buy pencils for school. I must have bought about 30 packs. I am obsessed with Ticonderoga pencils. If you have kids in school, please buy these pencils for them. Their teacher will thank you. The plan was to get up early and spectate the Rock ‘n’ Roll Half Marathon. Did not happen. I slept in till 8 and then did a few things around the house and got things ready for my nephew because he was heading back home to San Antonio. We were invited to my cousin’s house for his birthday. We had a great time but had to leave the party early to take my nephew to the airport. It was 10:00 by the time I got home and I went straight to bed. Week 6 went well. My tempo run went well (again) and I missed another workout on Sunday. Oh well, life happens. In week 7 I have a ladder workout (400-800-1200-1600-1200-800 with 400m jog recovery) which should be interesting and another 7 mile tempo run on Thursday. Your kitty looks almost exactly like one of mine, except mine is bigger. So cute!! Thanks! I am trying to keep up with my runs. However, my speed and tempo runs are done on the treadmill but for the other runs I try to get them done outside. Sounds like a great week of training! Your new Brooks Launch shoes are cute! I love Brooks shoes! I’ll have to get those Ticonderoga pencils for my son. Thanks! Yes, those pencils are amazing. Almost every teacher I talk to agrees as well. Sounds like a great week! I thought Finding Dory was super cute! Love the pic of the double rainbow! Thanks! It was a cute movie but kind of similar to “Finding Nemo”, right? I haven’t seen Finding Dory yet but I want to. That double rainbow is the coolest pic ever! You had a nice solid week of training. I’m impressed that you are using the Hanson’s Method. My aging body needs more rest than that! It’s so hard to hit my paces in this heat/humidity that I’m sure my time goal for Chicago will be changed. Thanks for linking, Zenaida. Thank you! You must see that movie. Very cute. The Hansons Method is not easy but doable. I have my days were I struggle and when I want to quit but I think that is normal with any marathon plan. Most of my runs are outdoor but my speed and tempo are done on the treadmill which helps keep me on pace. Lola is so adorable! I haven’t seen Finding Dory yet, either, but it’s on the list. My biggest question from Finding Nemo was what happened to the fish that escaped in their plastic bags??? I hear it gets addressed in Finding Dory. The rainbows were so beautiful. My entire Instagram feed was flooded (parden the pun) with pictures of them that night. How awesome to see two rainbows, I have never seen two either! I do like those shoes!!! Very cool! I am waiting for Dory to come out on video, that’s the only way I’ll see it with my kids being older. Oh yea seeing anything is better at the movies. 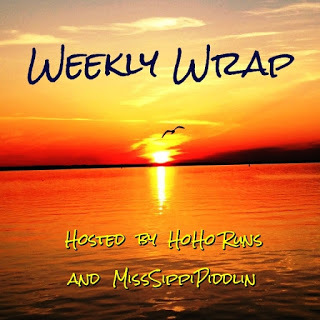 Awesome miles and great job for the week! I thought Finding Dory was cute too. 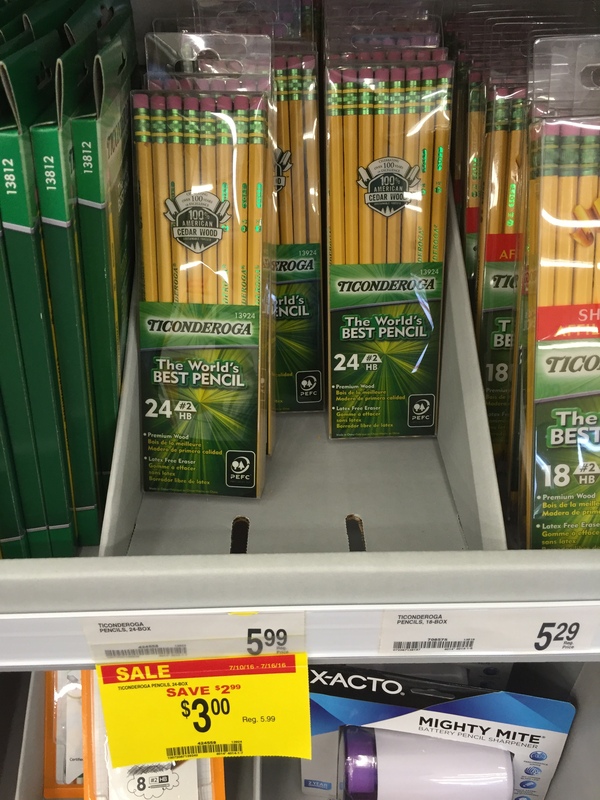 What is special about the Ticonderoga pencils? They write smoothly and don’t break easily. They’re not cheap but worth it.